We’d love your help. 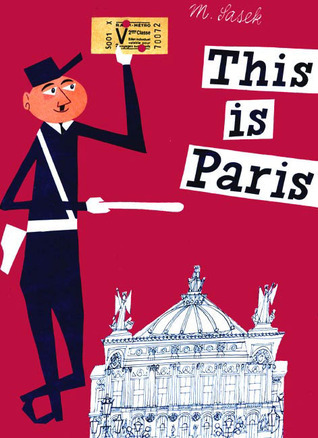 Let us know what’s wrong with this preview of This Is Paris by Miroslav Sasek. To ask other readers questions about This Is Paris, please sign up. Such a cute picture book, one that left my husband and I saying, "How did we miss seeing [fill in the blank] in Paris?!" Whether you want to prepare a child for an upcoming trip, or you simply want to broaden their world and show them what life is like somewhere else, this is a super cute, simple, yet marvelous addition to any child's (or adult's) bookshelf. The bits and bobs of 1959 Paris, with annotations. Like San Francisco, not much in this book has changed. Šaškovy ilustrace jsou něco neskutečného, opravdu je to takové pohlazení po duši. Každopádně kniha To je Paříž mi přišla - jak texty, tak samotnými kresbami - o něco slabší, než To je Praha, která byla od Šaška mou prvotinou. I received this book for Christmas. Besides having fun identifying the sights I knew, the book is one that would work as a model for students to write about any place they know well. Some of the places are followed by details that show more depth of knowledge--and that's what I'd go for if I had students write their own books about a place. One of a lovely series of old school picture books about different cities of the world written in (simplified) Chinese. My reading comprehension isn't great, so I stumbled my way through the book being able to read about 50%, and understanding about 80% (with a little bit of cheating/guessing when I could recognise the landmark or facet of Paris illustrated). i got this book for the kids to read during our upcoming trip to paris with the stewarts. it's absolutely fabulous! love that even though it was written in 1959 there isn't a whole lot that needs updating. i love everything about it, actually. will for sure be getting the rest of the books in this series. Love the art. Casual chatty tone. Great series and author/artist to know about. Certainly dated (Les Halles isn't there anymore) but still a great book -- a first travel book for children, with elements they will appreciate (at one end of the Champs-Elysees "is a garden where you can ride on a donkey." The illustrations are lovely and really fit the atmosphere of Paris. What a great introduction to Paris, and a fun series. I now know to be sure to avoid horse meat there, not to take the stairs on the Eiffel Tower, and have a good list of must-sees. Plus the artwork is great and it's aimed at things kids would notice, like the various types of lampposts. Originally published in 1959 and republished in 2004 this books is still a treasure! There are few clarification at the back of the book, but there aren't enough to have it detract from the information! Love the Vintage feel! Enjoyed the information! One day Paris..One day! A bit old fashioned, but very recognisable story about Paris. Vivid drawings, nice story-telling with some fun facts for kids (eg number of cats living in paris). Books you have to collect if you're passionate about famous cities! I keep finding these in thrift stores and the art is seriously stunning. Sasek quickly became one of my favorite illustrators and I look at these all the time for ideas. Beautiful, beautiful series of books. I love Paris. I love this book. I'm going to Paris again soon and am going to check out a few sights that this book has taught me to love already (the dog cemetary for instance) and reappreciate the oldest public clock- we found it last time but didn't appreciate it's significance. Gorgeous illustrations! Read to my daughter who was home sick this week. She is a 3rd grader, and we are reading chapter books...but this was a fabulous journey back to picture books. We both loved it! Polskie wznowienie klasycznej, nagradzanej książki czeskiego ilustratora z 1959 r. (jednej z serii) - nakładem wydawnictwa Dwie Siostry. A great little tour of Paris. The illustrations are terrific too. Check out all the other books by Miroslav Sasek. thanks for the rec, Lisa - these look like fun for the kids! I got this book as a gift from Caroline, Campbell, Jon, Chrissy, and Joey. It's a beautiful old-fashioned book that explores Paris through a child's eyes. Love it! Merci, kids! Loved the pictures. Need to go to Paris. A sweet book about all the cool sights in Paris with a bit of history behind each one. Totally charming, I will definitely buy a copy before my first trip to the city of lights! This is a neat travel book for kids. This book is about the city of Paris. Sasek's travel books are so clever and informative. A delight to read and read again. This is a fun one to review all the landmarks in Paris. The kids love it! I love, love these books written and illustrated by Sasek. The story is good, but admittedly, I love the illustrations more. nice for children, unexpected view on Paris. Un peu Paris archaique, la "nouvelle" Paris manque. Excellent illustrations and v. cute. Interesting to see how Paris has changed since 1958, but still--it would be marvelous to have an updated version.